Using a novel imaging method, a Massachusetts General Hospital (MGH) research team is investigating the mechanisms behind a potential targeted treatment for a subtype of the deadly brains tumors called gliomas. 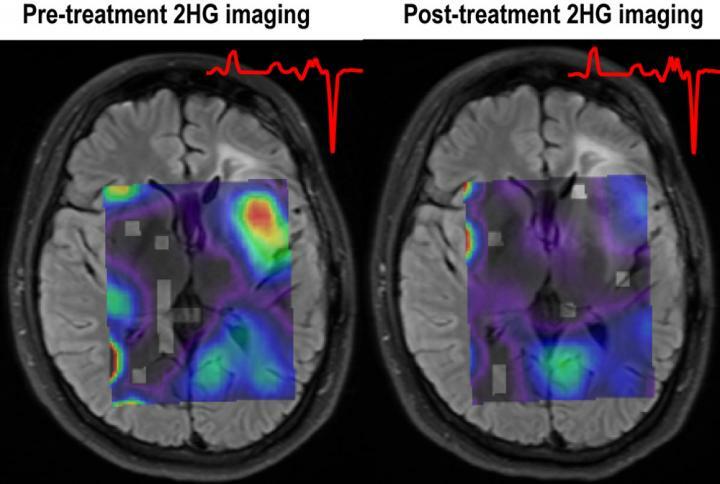 In their report published in Nature Communications, the researchers describe using magnetic resonance spectroscopy (MRS) imaging – which reflects metabolic rather than structural aspects of tissues – to determine whether treatment with an investigational IDH1 inhibitor reduced levels of a tumor-associated metabolite in patients with IDH1-mutated gliomas participating in a clinical trial. The MGH and Dana-Farber Cancer Institute are one of the sites for a Phase 1 clinical trial of the IDH1 inhibitor IDH305 for IDH1-mutated glioma treatment. Of eight patients who had enrolled in the trial at time of the current study, MR imaging data collected before and a week after treatment began was available for five. Three-dimensional MRS imaging of the data found that 2HG levels dropped around 70 percent after treatment initiation. Levels of additional metabolites connected with the mutant IDH1 pathway – including glutamine and glutamate – were altered in response to IDH305 treatment, indicating a potential metabolic reprogramming of the tumor.